When people think of the Blue Angels, most people think of the F-18 Fighter jets. While they aren’t wrong, a big, blue C-130 jet-assisted cargo plane is also part of the Blue Angel entourage. 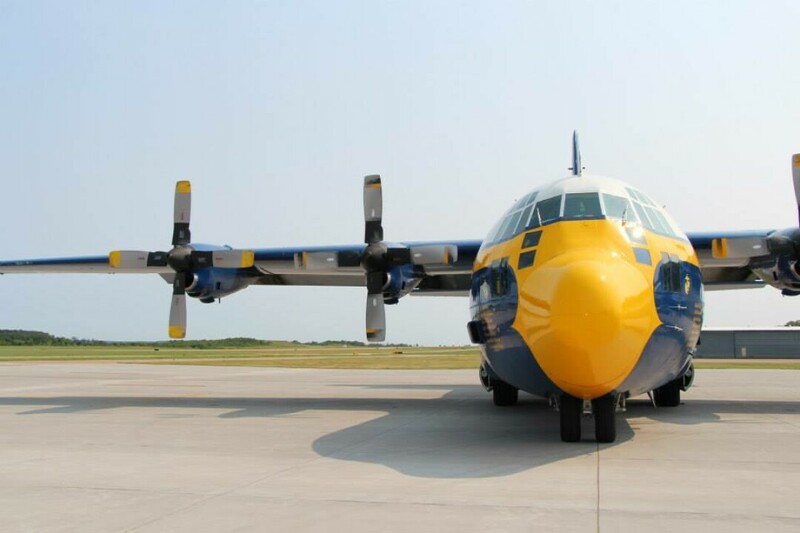 While not as sleek or stylish as its more recognized counterparts, Fat Albert still packs a punch. I was one of 9 media passengers and about twenty members of the National Guard and Navy on Fat Albert when it flew a demonstration over Eau Claire earlier today (Friday, July 3) in anticipation of the Chippewa Valley Air Show (July 4 and 5). While I’ve been on several dozen commercial flights in my time, this was nothing like anything I’d ever experienced before. After several briefings on the runway and ten minutes of exploration time onboard, we were instructed to buckle up and enjoy the ensuing ride. While your typical commercial airliner ascends at approximately 10 degrees, Fat Albert does so at a 45-degree angle. During takeoff, we experienced two G’s, pushing us back into our seats and were then quickly subjected to negative G’s, launching us into the upper limits of our harnesses. Don't worry, they didn't let me drive it. As I was strapped into the sides of this vessel and familiarizing myself with the extreme physical forces, the crew members chose to stand the whole time, only holding on when no other option presented itself. While the ups and downs of this flight were certainly stimulating, the sharp turns are what really made me nearly lose my intentionally light lunch. This plane turns at about sixty degrees and then immediately does so the other direction, while your typical airliner rarely does so at more than 15 degrees. The big turns, steep climbs and intense dives went on for nearly ten minutes, until we made one last dive toward the runway, touched ground; and then the pilots immediately slammed on the brakes, bringing us to an abrupt stop. We were all thrown forward again as we skidded to a burnt rubber-scented stop. It took me a few minutes to reacquaint my legs with the ground, but I was happy to be back on land. Fun fact: The guy sporting the aviator shades is the only one who isn't a pilot. Editor's Note: Volume One was lucky enough to be offered a ride in a sweet-looking stunt plane, courtesy of the Chippewa Valley Air Show. So we stuffed our intern James into it and said, "Good luck, man!" V1 intern James strapped into the front of a two-seat "Pitts" aircraft for aerobatic stunts with pilot Mike Wiskus of Lucas Oil Air Shows, all part of the Chippewa Valley Air Show 2015. You can read more about the experience here.